Natural State Baseball is pleased to announce its 2018 All-Arkansas Collegiate Team and Awards. The University of Arkansas was the 2018 Team of the Year. The Razorbacks went 48-21 this year and reached the College World Series Championship Series. After a 21-12 conference season, the Razorbacks earned a #5 national seed. They went 3-0 in the Fayetteville regional and 2-1 in the Fayetteville Super Regional to advance to the ninth College World Series in program history. In Omaha they recorded wins over Texas, Texas Tech, and Florida to advance to the Championship Series, where they went 1-2 against Oregon State. Dave Van Horn is the Natural State Baseball Coach of the Year. In his fifteen seasons as the head coach of the Arkansas Razorbacks, he has led the team to fourteen NCAA Tournament appearances and five trips to the College World Series. Southern Arkansas’s Jacob Richardson is the Player of the Year. The senior third baseman for the Muleriders was the Great American Conference Player of the Year and an All-GAC First-Team selection. He batted .374 this season and had a state-leading 23 doubles to go with 13 home runs. He also drove in 71 runs, the most in Arkansas. Richardson was also a member of the Natural State Baseball All-Arkansas team in 2017. Blaine Knight of Arkansas is the Pitcher of the Year. The junior right-hander went 14-0 this year, with a 2.80 ERA and 102 strikeouts in a state-leading 112.1 innings pitched. He led the SEC and was second nationally in wins. Knight was selected in the third round of the MLB draft. Knight, a native of Bryant, Arkansas, is also the winner of The Natural, given each year to the best player originally from the state of Arkansas. The Freshman of the year is Razorback left fielder Heston Kjerstad. Kjerstad batted .332 with 16 doubles and 14 home runs batting in the middle of the Razorback’s lineup all year. Natural State Baseball is pleased to announce its 2017 All-Arkansas Collegiate Team and Awards. The University of Arkansas was the 2017 Team of the Year. The Razorbacks went 45-19 this year, improving on a 26-29 season a year ago. 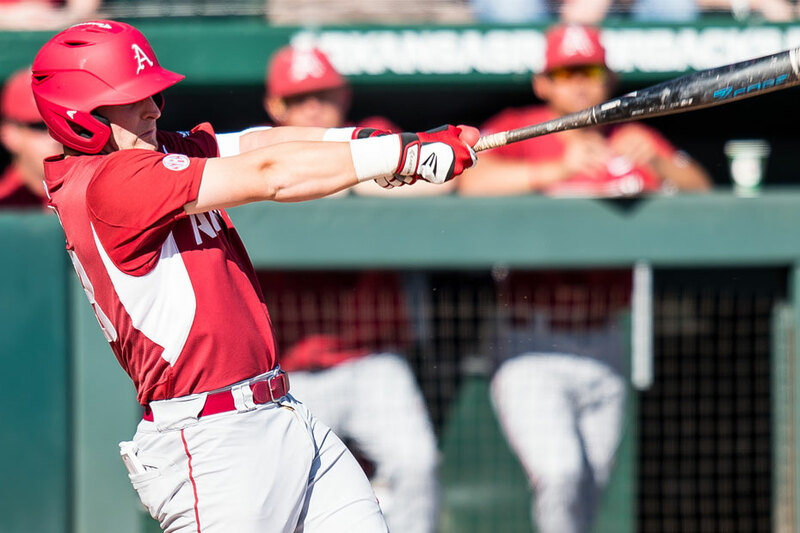 After a solid showing in the SEC Tournament, including a no-hitter and two run-ruled shutouts, Arkansas hosted a regional in Fayetteville and advanced to the regional final. Justin Pettigrew, first year coach of Southern Arkansas, is the 2017 Coach of the Year. Pettigrew has been with the Muleriders since 2005 and was promoted to head coach following the 2016 season. He led the Muleriders to a 39-16 record, including 28-5 in conference, a 9 game improvement on the previous season. The team advanced to the NCAA regional tournament. Southern Arkansas’ Trevor Rucker is the 2017 Player of the Year and the winner of The Natural, which is awarded to the top player from the state of Arkansas. Rucker, a native of Prescott, batted .393 with 20 homeruns and 20 doubles, and stole 20 bases. Rucker was the Natural State Baseball Freshman of the Year in 2014. Tyler Tognarine of Lyon is the 2017 Pitcher of the Year. He went 11-5 with a 1.99 ERA and picked up 4 saves. He had 92 strikeouts in 113.1 innings. Tognarine has previously been named to the Natural State Baseball All-Arkansas teams in 2016 and 2015, and was the Freshman of the Year in 2015. The Freshman of the Year is Nick Kreutzer of Arkansas Baptist College. Kreutzer hit .404 on the season with 14 homeruns, 12 doubles, and 2 triples. He drove in 57 runs. JT Stalnaker (JR/Tallahassee, FL) added to his list of accolades for the 2017 season by being named a 3rd Team All-American Catcher. This is Stalnaker's second consecutive All-American honor as he was named 2nd Team All-American last season as a sophomore. Prior to being named an All-American, Stalnaker was selected 1st Team All-Conference, Conference Player of the Year and 1st Team All-Central Region. #18 runs batted in (49). Three Central Baptist College baseball players, Ben Madison (SO/Benton, AR), Jalin Lawson(SR/Troy, AL) and Cole Johnson (SR/Fordyce, AR), were selected for National Christian College Athletic Association awards this morning. Madison was chosen as a first team All-American, Lawson was selected to the second team and Johnson received Scholar Athlete recognition. Three Arkansas baseball players had their great play on the field recognized as Grant Koch, Jax Biggers, and Dominic Fletcher each were named all-conference players Monday by the Southeastern Conference office. Koch leads the trio as a first team All-SEC catcher, while Biggers was named as a second team All-SEC shortstop. Fletcher is part of the SEC All-Freshman Team in the outfield. Arkansas State infielder Alex Howard has been named the Sun Belt Conference's Player of the Week for his performance during the last week of the regular season the league office announced Monday morning. Howard was a key part of A-State's offensive effort in its 3-0 week, which included a win over Ole Miss May 16 and two wins against Little Rock May 18-19. The junior hit .467 (7-for-15) on the week with a .733 slugging percentage. He drove in a team-high eight runs and reached base three times in each game.